The Chicago Blackhawks may have started slow in Game 5 on Thursday night, but they finished with a flourish as they rode the momentum of three second-period goals en route to a 5-1 victory over the Minnesota Wild. 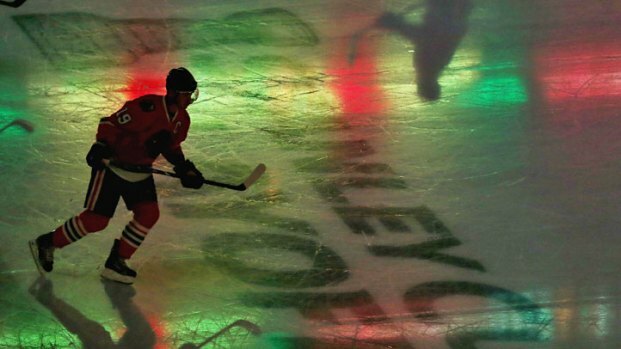 The victory sent the Blackhawks to the second round of the Stanley Cup playoffs, where they will either face the San Jose Sharks or the Detroit Red Wings, if they can beat the Anaheim Ducks in their series. Much has been made of the fact that the Blackhawks captain has not scored in this series, but he definitely came to play on Thursday. On the Blackhawks’ first goal, the headlines will go to Marian Hossa for netting the goal (more on him later), but the credit for the setup has to go to Toews and Brandon Saad. On the play, Saad performed an excellent stick lift behind the net, and Toews took the puck and fired a gorgeous pass to Hossa for the tally. On Patrick Sharp’s power play goal, it was Toews again who was in the middle of the action, jumping into the play and creating traffic in front of Minnesota goaltender Darcy Kuemper. The two plays show the versatility of the 26-year old Toews, and emphasized to Hawks fans that even though he isn’t putting pucks in the net, that he is still contributing to the team in a big way. Kruger had a goal and an assist in the game, but it was the way that he obtained the two points that really hammered home what a great game he had. On Kruger’s goal, it was Duncan Keith who fired a dump pass into the zone, which was picked up by Michael Frolik. He then skated towards the net and fired it towards the net, and Kruger managed to get a stick on it, deflecting it wide. Not giving up on the play, Kruger darted behind the goal, grabbed the puck, and pulled off a nifty wraparound by shooting the puck off of Harding’s back skate. Kruger also had a great play on Hossa’s second goal of the game, when he won a puck battle in the corner and pushed the puck over to Brandon Saad, who shot the puck to the front and allowed Hossa to maneuver the biscuit into the basket. It wasn’t a banner night for Kruger in the faceoff dot, but his excellent play in doing the little fundamental things was instrumental in the Hawks finishing off the Wild. Naturally, the number one star of this game has to be Hossa. He seemed to be everywhere in the contest, and while he may not have done the little nitty gritty stuff that the other two guys on this list did, his second goal of the game was a thing of beauty. On the aforementioned pass from Saad, Hossa managed to keep his back to Harding (thus keeping the puck away from him) and turned his hands over to flip a backhand shot into the net for the goal. It was a play that only a select few guys would have the patience to make, and Hossa definitely qualifies.